The adorable picture above should be enough to convince you to see The Five-Year Engagement. Let's review that cast, shall we? Jason Segel, Emily Blunt, Chris Pratt, Chris Parnell, Alison Brie, Mindy Kaling and Jacki Weaver. It's like all of the people who had enough brains to turn down New Years Eve got together to make a movie that would actually be watchable! Yes, Judd Apatow already hit it big this year making fun of weddings with Bridesmaids, but this looks like a completely different story and sentiment—surprising, considering the boilerplate style of The Hangover: Part II. Side Bar: anyone else completely caught off guard by Alison Brie's British accent? 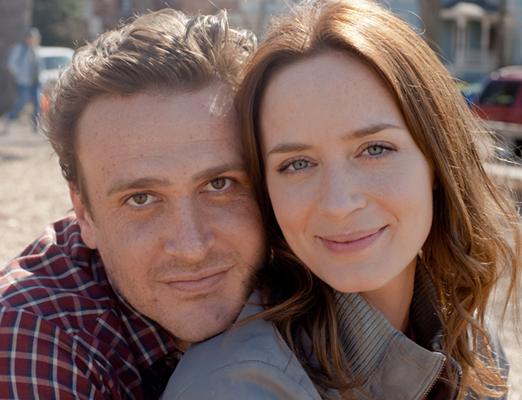 The Five-Year Engagement hits theaters April 27, 2012. Also known as Not Soon Enough.